All salamanders are born in water, but not all remain in it. Salamanders come in three types: terrestrial, aquatic and semi-aquatic. Terrestrial salamanders live on land but congregate in water to breed. 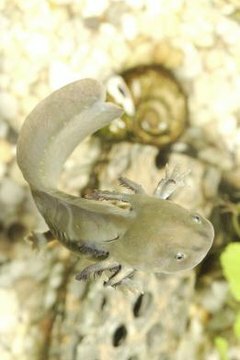 Aquatic salamanders spend their whole lives in water. Semi-aquatic salamanders spend part of their adolescence on land and return to water to reproduce. No matter where they live out their days, nearly all salamanders follow the same pattern for reproduction. The male and female salamander meet in a body of water. They may choose rivers, streams, swamps, ponds or lakes in which to propagate, depending on their species and geographic location. Often mating takes place around the same time as spring thaw. Males initiate spawning by producing spermatophores -- cones of jelly topped with sperm -- and through an elaborate dance coax the females to it. When the female accepts the sperm, she takes it into her cloaca, her reproductive system vent. After a few to several hours, the female will begin laying individual eggs, sometimes hundreds in one spawning. The fertilized eggs are then anchored in a jelly mass to underwater plants or structures. In some species, one of the salamander parents guards the eggs until they hatch. Terrestrial salamanders live in moist, dark places where they can keep their sensitive skin hydrated. They live under rocks and rotting logs, and in dead leaves on the forest floor. They tend to live near bodies of water so that when it's time to mate they don't have too far to travel. In terrestrial species, the baby salamanders venture onto land to live out their existence after completing the larval stage of development. The yellow-spotted salamander (Ambystoma maculatum) is a terrestrial species that's widespread in North America but is rarely seen because of its secretive nature. The arboreal salamander (Aneides lugubris) actually lives in trees and is native to California. The lungless land salamanders are unusual because they lay eggs in moist soil on land rather than in water, and the young hatch into tiny salamanders rather than larvae. Some species of salamander live their whole lives in the water. Many of these species retain their gills, unlike other salamanders that lose their gills when they morph from the larval to the adult form. The axolotl (Ambystoma mexicanum) is an aquatic salamander that has prominent external gills used for breathing in the cool lakes of Mexico. The mudpuppy (family Proteidae), a very common aquatic salamander in North America, also retains its gills. Other aquatic salamanders simply breathe through their skin, such as the hellbender (Cryptobranchus alleganiensis), the largest salamander in North America. The siren (family Sirenidae) has both gills and lungs to adapt to varying environmental conditions. Some salamanders are able to live on land and in water. This lifestyle is most common for salamanders in the family Salamandridae. These salamanders are usually called newts -- all newts are salamanders, but not all salamanders are newts. The general life pattern for newts is to be born in the water, live out the larval stage there, spend their juvenile period on land, and then return to the water when they reach reproductive age. As they develop into juveniles newts, they lose their gills and rely on lungs or breathe through their skin. When they reach sexual maturity, the newts return to an aquatic lifestyle and breed annually. The red-spotted newt (Notophthalmus viridescens) and the Chinese fire-bellied newt (Cynops orientalis) are examples of semi-aquatic salamanders that follow this life cycle.